Housed in the Ashmolean Museum in Oxford is a portrait by Cornelis de Neve of an elderly gentleman wearing a red or Murrey gown and a dark blue, nearly black, mantle embroidered with the shield of St George. These represent the Elizabethan robes of the Poor Knights, in what is believed to be the only record of the uniform before it was changed in 1833 under William IV. The sitter’s name is Nicholas Burgh, and he was a Poor Knight of Windsor between 1661 and 1670. The portrait was bequeathed to the museum by Elias Ashmole in 1692, but what is the history of this portrait? Captain Nicholas Burgh was appointed to the Poor Knights of Windsor, a community of retired military veterans who were offered accommodation in Windsor Castle in return for attendance in St George’s Chapel, on 19thFebruary 1661. He was a highly cultured gentleman, with a taste for art and literature. His commonplace book, held in the Ashmole manuscripts at the Bodleian Library, Oxford, is a large collection of poems, songs and epitaphs that contains otherwise unknown references to works by Shakespeare; various drawings by him are also in the Ashmolean collection; and he was the author of a volume on Ludgate Prison, called A Carracter of Ludgate. King Ludd’s gate is a place of great receipte. He was a skilled carver, who had trained as a goldsmith, and he gave to the Tradescants cherry stone and ivory carvings of St George for their museum that would later form the core of the Ashmolean. A strong supporter of the Stuarts, it is likely that he fought for the Royalist troops during the Civil War, leading to his appointment as a Poor Knight by the nomination of Charles II himself. Burgh was clearly a close friend of Ashmole, as there are several personal letters from him in the Ashmole manuscripts. Ashmole’s great work was to write the first history of the Order of the Garter, a project he started before the Restoration but which was eventually published in 1672. He was a regular visitor to Windsor during this time in order to use the records held by the chapel relating to the Order, many of which he took with him and which now also make up part of the Ashmole manuscripts. In addition, as Windsor Herald, Ashmole would have been actively involved in the Garter Ceremony, processing along with Burgh in his role as a poor knight. Burgh died on 23rd June 1670, and was buried in St George’s Chapel. 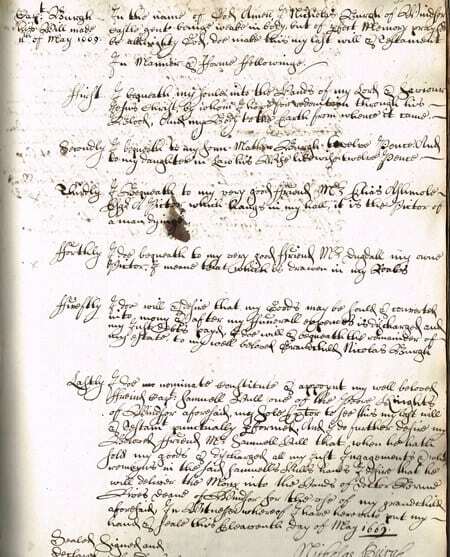 In his will dated 11th May 1669, written up in the College Register [SGC XIII.B.2, pictured here], he divided his goods between his friends and family. To “his very good friend Elias Ashmole” he left a picture in his hall of a man dying. To William Dugdale, he left the picture of himself drawn in his robes, presumably this portrait. William Dugdale was a fellow herald, but more importantly, he was Ashmole’s father-in-law. It would seem reasonable to suppose that knowing of Ashmole’s interest in Windsor and his close friendship with Burgh, Dugdale left the portrait to his son-in-law. The portrait remained with the family until Ashmole’s death in 1692 when the remainder of his collection was bequeathed to the Ashmolean Museum.